You can have a rotation full of aces, but without a solid relief corps to get you to the last out, you’re going to have a hard time winning. Here is a bullpens worth of budget relief pitchers to help you get the last outs in MLB The Show 18’s Diamond Dynasty mode. Picking the right relief pitchers is essential if you want to build a team for success. Here are some budget relief pitchers that can help you early in your Diamond Dynasty year. Green stepped up to be a dominant force in the Yankees bullpen last year, leading to him get a pretty beastly card in Diamond Dynasty this year. 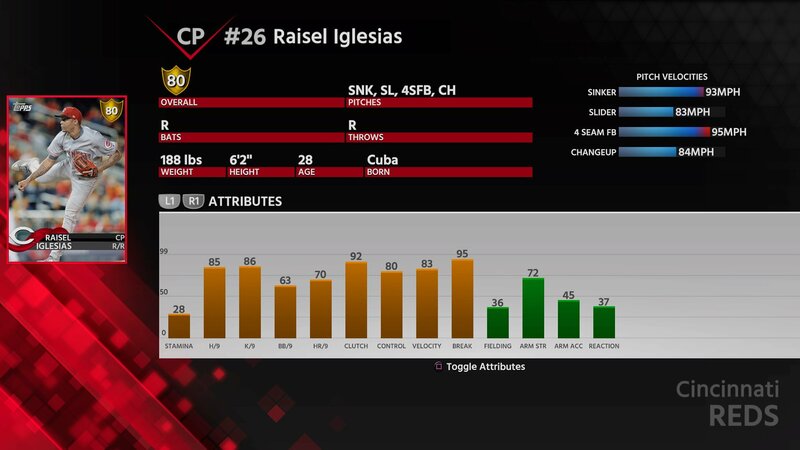 His pitch mix, lead by a 96 mph 4-seam fastball, and a sharp slider, and a great combination of 85 H/9 and 95 K/9 make him a valuable pickup that can be in you bullpen for quite a while. With an 82 H/9 and 87 K/9, Parker will make for a good good setup man in your bullpen. His 4-seam fastball stays around 93 mph, and his splitter at 81mph will fall off the table, and lead to a lot of ground outs. He’s definitely a good option to go to when there is a runner on first base, and you need a double play. Indians’ reliever Andrew Miller is one of the best Live Series relievers in Diamond Dynasty. The problem is, he costs over 70,000 Stubs. Josh Hader, at roughly 800 Stubs, is a poor man’s version of Miller. 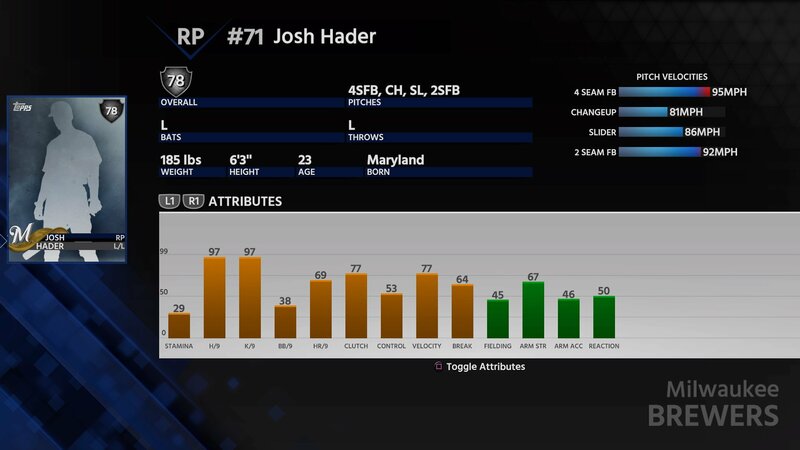 With an upper-90s 4-seam fastball, decent changeup and slider, Hader will be extremely difficult on left-handed hitters. Hader, along with the aforementioned Miller, and Arolids Chapman, are the only Live Series left-handed relievers with over 95 H/9 and 95 K/9. Knebel, much like his real-life teammate, Hader, can be compared to another dominante, much more expensive closer. Red Sox’ closer, Craig Kimbrel is very similar to Knebel, but he is 50x the cost. Also, Knebel has something that Kimbrel doesn’t have, a changeup, which gives him a third speed level in his pitch mix. 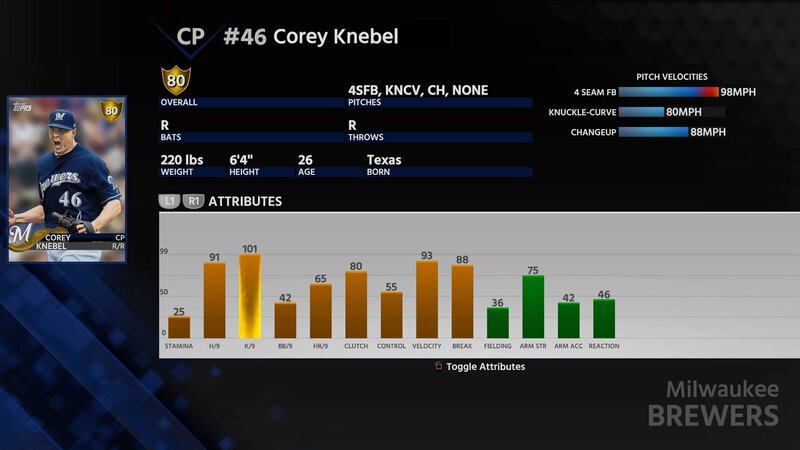 Knebel is only one of eight Live Series relief pitchers to have a K/9 rating over 99, at 101. After converting from a starting pitcher to a reliever, Iglesias has become a top flight closer for the Cincinnati Reds. With a 4-seam fastball that can get near triple digits, a power sinker, and a very good slider, he will keep batters on their toes, en route to an inevitable strikeout, or slow roller. Familia is essentially the light version of Raisel Iglesias. The main difference between the two is that Familia throws a little bit harder, but he won’t excel as well in clutch situations. With a mix of a sinker, slider, splitter and a 97 mph fastball, batters won’t know what’s coming their way. 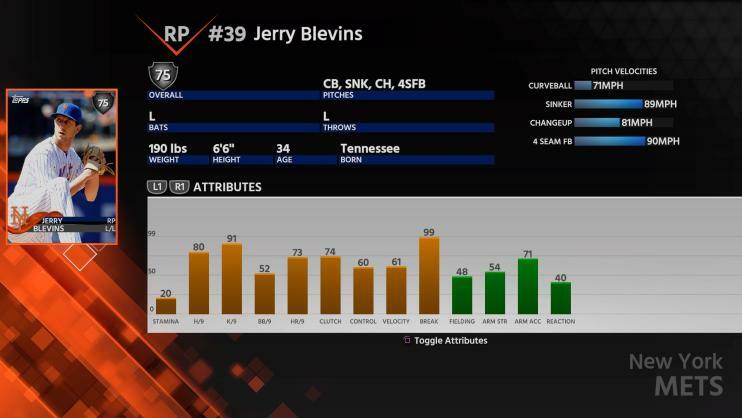 Not everyone can throw 100 mph, and that’s OK. Jerry Blevins throws a knee-buckling 71mph curveball this will keep even the best of hitters off balance. His 91 H/9 will help him miss bats, and the near 20 mph difference between his curveball and 4-seam fastball will frustrate hitters, even if he’s not a fire-baller. 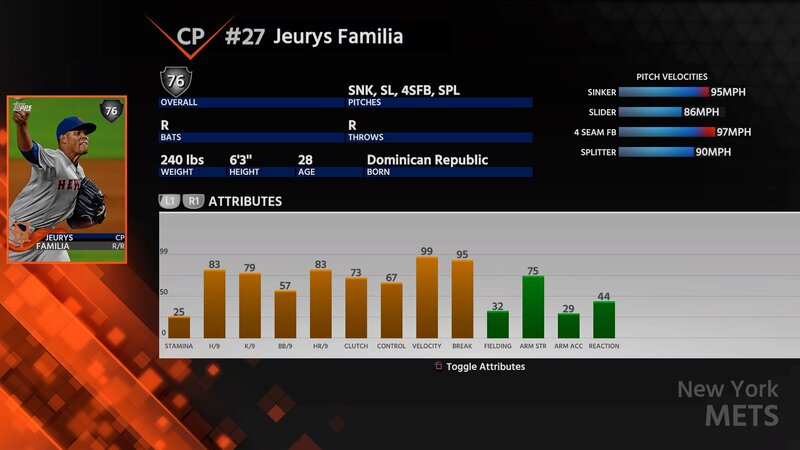 This concludes our MLB The Show 18 Diamond Dynasty Best Budget Relief Pitchers guide, but head over to our guides to the best budget offense players, or the best shortstops in the game.